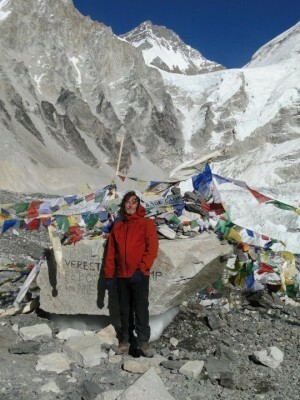 November 2009 I was invited to join a trek to Everest base camp. I had flight reservations for Kathmandu, Nepal on Cathay Pacific Airlines out of San Francisco but found myself in Palm Springs during an extreme windstorm. All flights had been canceled during the afternoon except mine which was able to land in a very short window of semi calm when the winds were not ripping the palm trees to shreds. The small turboprop plane landed and I found myself running to board the plane before the wind increased in velocity. Once we were in the air the plane was violently tossed sideways and up and down. This was one of the roughest flights I have every been on and I have flown extensively. The twenty something year old pilot and copilot had to work at flying the plane and everyone was quite appreciative once we finally arrived in San Francisco. I met my friend and quaffed a couple of stiff drinks before boarding our airliner for Asia and thankful that I made my flight connection. After an eight hour layover in Hong Kong and a short refuel in Dhaka, Bangladesh we arrived In Kathmandu. We spent a couple of nights at the famous Kathmandu Guest House and revisited many of the sites I had seen in 1999. The city was the same as not much seems to change in Kathmandu. The next stage of the trip was the 50 minute flight to Lukla and its notorious landing strip. Safely on the ground we began our two day trek to Namche Bazar. The valley had changed rapidly since my last visit with an amazing number of tea houses having been built. I recognized one house from before but commercial enterprise has descended on the valley with amazing speed. Namche had developed as well and even the open trailside sewer was now underground. I was somewhat disappointed as the remoteness I felt before was now gone. It is all relative to ones memories and experiences so I am sure my traveling companions had just the opposite impression. The few days at Namche was spent acclimatizing with one long hike that took us to the Japanese Hotel and our first view of Everest and on the return a stop at a school that Sir Edmund Hillary had built for the local Sherpa people. 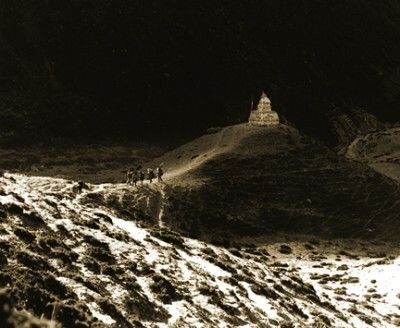 I had the usual stomach issues set in and for the rest of the trek fought the grumbling demons. The remaining trek to Base Camp was truly enjoyable. We had two additional stays along the way with more acclimatization hikes. At one of our rest breaks we stopped for lunch at a tea house that had a horse who freely wandered amongst the dining tables that were set up outside. A tourist was sitting writing in his journal with an apple on a plate in front of him. We watched as the horse snuck up behind him and reached over the unsuspecting victims shoulder and grabbed the apple with his teeth and trotted off, leaving the tourist shocked and almost falling out of his chair. A young Sherpa woman came dashing across the dining area hurling small stones at the horse as it sauntered away. It was a great little scene. After many miles of trekking we finally arrived at the four tea houses that comprise Everest Base camp and were able to secure lodging for two nights. At over 16,000 feet it is brutally cold at night once the radiant heat of the sun is gone. As dark comes all the humans gather in the one communal room/dining area and huddle around the small yak dung burning stove waiting until it is late enough to head straight back to their beds and climb into their zero degree sleeping bags. The second day we walked the last section to the area officially known as Everest Base camp which is the location of the original base camp, not the current one. The Khumbu glacier has receded a long way up the valley since Hillary’s climb. 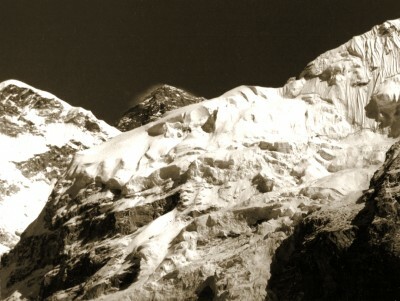 Arriving beneath Everest it is very obvious why the original team selected the route for the first ascent. Gazing up at the vertical ramparts of the valley the Khumbu glacier clefts the walls in two. Before you lies the way to the top of the world.